Itching in the inner ear is most commonly caused by ear dryness, earwax buildup, allergies, infection or skin conditions. Understanding the cause is the key to a successful treatment plan. Minor itching related to dry ears or too much earwax may be successfully treated at home, but a medical evaluation is important if you have persistent itching or pain. Earwax, or cerumen, moisturizes and protects the lining of the ear canal, and prevents dry, itchy ears. Sometimes a hot, cold or windy environment causes the ear canals to dry out. Aggressive removal of cerumen from the ear canal can also lead to dryness. In most cases, the best remedy for dry ears is to stop removing earwax and protect your ears from harsh environments. Adding a few drops of vegetable oil to the dry ear canal may also help provide a temporary layer of protection. If home treatment doesn't resolve dry ears, see your doctor. The body has a way of getting rid of excess cerumen. The tiny hairs that line the ear canal, along with normal jaw movements, gradually move the excess towards the ear opening, where it can fall out or get cleared away after bathing. If allowed to build up, however, cerumen can cause irritation and itching in the ear canal. 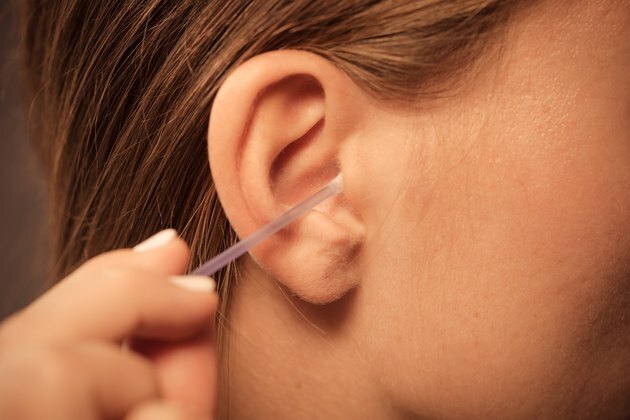 Foreign objects -- such as cotton swabs or bobby pins -- should not be used to remove this wax, as they can scratch or injure the inner ear and remove too much wax. Instead, treat excess cerumen with drops of oil, glycerin, commercial drops or hydrogen peroxide. When the wax softens, it may come out on its own. Get advice from your doctor if you aren't sure of the best way to remove earwax at home, and see your doctor if using drops is not successful. Itching is a common symptom of allergies, and inner ear itching may be one of the first signs of an allergic reaction to a food or medication -- or associated with seasonal allergies. If your allergy is not yet diagnosed, see your doctor for a treatment plan. Avoiding allergens, when possible, is the best way to prevent the related symptoms. For diagnosed allergies, your doctor can outline a treatment plan which may include antihistamine medications or, in some cases, allergy shots. Some allergies are life threatening, so seek immediate medical attention if you have swelling of the lips or tongue, difficulty breathing, dizziness or severe hives. Your inner ear might itch if you have an infection, and this may require treatment. If your itchy ear is accompanied by pain, or if the itchiness persists, see your doctor. Sometimes the itchiness is related to irritation, caused by chemicals from shampoo or other hair care products, and avoidance of these products is the best management. Earbuds or hearing aids may also cause irritation due to chafing or trapped water in the ear canal, and getting properly fitted for your hearing aids and taking breaks from wearing earbuds may correct this problem. Certain skin conditions, such as dermatitis, can lead to dry, itchy or flaky skin -- which may affect the ear canal. Depending on the skin condition, your doctor can outline a treatment strategy which may include drops for the ear canal, or steroid cream for outer ear. Itching in the ear is rarely serious, and can often be treated at home. However, if the cause is not related to dryness or wax buildup, a doctor's assessment may be helpful so you understand the cause and an effective home treatment plan. For ongoing pain, itchiness, drainage or other ear discomfort, see your doctor.